It’s 6:00 o’clock in the morning: A normal day for Takugo Kobayashi as he meets with his team and prepares to start his work. 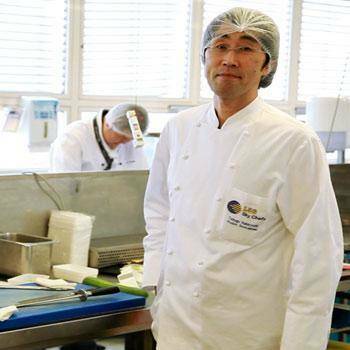 From sushi to takoyaki – it’s all made here, in the Japanese kitchen of LSG Sky Chefs at Frankfurt Airport, Germany. Each airline customer has his or her own wishes and demands and it all has to be ready in time. Today, many airlines are offering their passengers a complete travel experience that also includes top-notch, international cuisine. Especially in Premium Classes, the demand for more worldly flavors as well as authentic, regional cuisine is on the rise. Thankfully, LSG Sky Chefs employs chefs from around the world, in order to provide its customers with true, global cuisine. Takugo has worked in the Japanese kitchen in Frankfurt for 20 years, after moving to Germany with his family. He learned to cook in Japan and in Canada – and still today insists on using his own knives in the kitchen. In addition to preparing authentic national dishes and recipes, international chefs like Takugo also bring other specific skills and capabilities with them. It takes a lot of light-fingeredness to band small rice packs or to make real Japanese maki. Of particular importance is also the high quality of the products which are used in the kitchen. Takugo likes that his daily work is always connected to his home country. After 20 years, though, he has also come to know a thing or two about German cuisine! But still, he says nothing will ever be better than real Japanese sushi.